(l-r) Hannah, Ruth, Nicole and Charlene. The money will pay for more than 450 counselling sessions for a child, young person or adult affected by a life threatening condition. Hannah Culff, Nicole Poa, Charlene Ridler and Ruth Squires decided to take on the challenge and support WHY following personal experience of the impact of a life-threatening condition. A significant portion of the money was raised on 16th February at ‘The Ball’ a lavish black tie event at Orchardleigh Estate where guests enjoyed a candlelit three-course meal, a raffle and auction, live music from the Hammervilles and dancing till late. Charlene also organised a race night in collaboration with Chapmanslade Village Hall in November, which sold out and raised an impressive £4,000, half of which came to We Hear You. 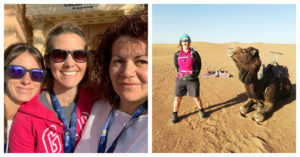 Director of WHY, Melissa Hillier says, “Congratulations to Hannah, Charlene, Ruth and Nicole for a truly amazing fundraising total and overcoming such a difficult experience. Community fundraising activities like these are essential to help us reach the many people in need of our help and we’re so grateful for their support. “We’re always looking for people to take on a challenge for WHY, whether a personal challenge such as giving up alcohol or chocolate, to climbing mountains or running marathons. Get in touch to find out more about how we can support you to take on a challenge for WHY at fundraising@wehearyou.org.uk or 01373 488577. To find out more about We Hear You’s free professional counselling service for children, young people and adults affected by cancer or a life threatening condition, visit www.wehearyou.org.uk.